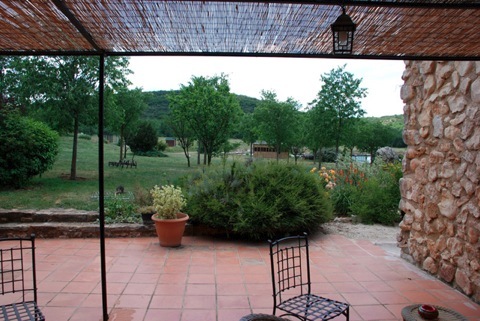 Welcome to France and welcome to Domaine du Planet. 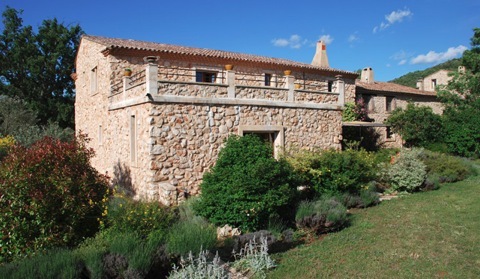 In a valley, 40 km from Marseille, you will find a hidden paradise known as Domaine du Planet. At this hotel they specialize in RC aircrafts and they have a local RC-club here. You can come here to enjoy your holidays and fly your models (or rent one) in a beautiful setting, and if you need to acquire some flying skills, you can attend a training course or book individual lessons with a trainer. When you aren’t flying (or if you bring family members that don’t share your interest) you can cool down by the pool, play tennis or other ballgames, go for a hike or fish in the small lake. 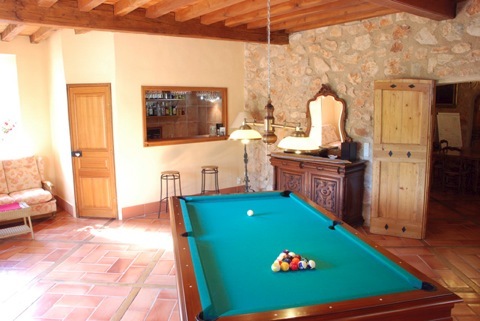 On the entrance floor of the main house you will find a living room, a billiard room with a bar, a TV-room, a small library and the dining room. The first floor is where most of the hotel rooms are located. There are four different ”classes” of rooms; Tradition, Comfort, Privilege and Suite Privilege. During our stay we lived in one of the comfort rooms, which was big enough for me, the wife and all the airplane models I brought. 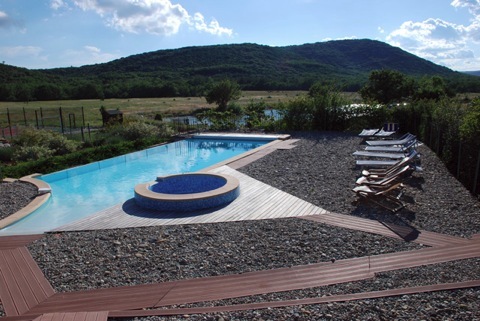 The hotel it self is built using natural stones which gives it and the rooms a cosy feeling. All the rooms feel light and spacious and everything feels top notch. It definitely has that ”X” factor that so many hotels lack. The rooms lack air conditioning, but there was no need for it during our stay, and I don’t know wether it is needed during the hottest periods or not. 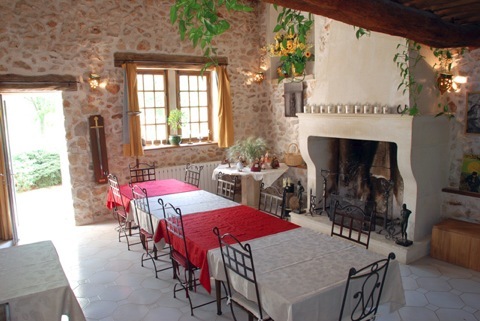 When it comes to food you will enjoy three-course French meals at lunchtime and dinner (with a cheese-tray as well at dinner) that will leave you completely satisfied. The food is really excellent and will suit most tastes, although me and my wife were quite unused to such amounts of food. The meals are really sociable, all the guests are sitting down together at one table and as most of us share the interest of RC, you won’t lack talking points. The language is a bit of a problem as most Frenchmen don’t speak English, but the owner speaks English quite well and the receptionist is ok. With other (French) guests and staff you will just have to try your best, if you don’t happen to speak French yourself, of course. Behind the main house there is a splendid garden in which the swimming pool, ballpark, lake and a pool house with jacuzzi are located. There you will also find many beautiful roses and flowers, for those with a gardening interest to enjoy. Rather than describing the hotel and ground in words I thought it much better to make a video, so that you can see for yourself. A rooster and some hens are walking about the place during the days, giving it more of a rural feeling and adding some cooing to the background noise that’s otherwise mostly composed of the sound from the motors of various models. The noise from the outside don’t go through the thick stone walls of the hotel though (except some jet-motors) so it isn’t going to disturb your peace. Have you ever thought about learning to fly Jet? This is the place to do it. Here, you will get the theoretical knowledge needed and get to fly their trainer-models with an experienced trainer at the buddy box, ensuring that it doesn’t have to end in a dangerous and expensive crash, as might be the case if you try it on your own. 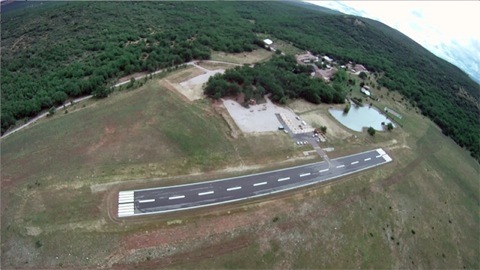 Domaine du Planet is possibly unique in offering landing-training for jet models. This is also a perfect place if you’ve thought about learning to fly FPV. The place is quite secluded, so you don’t need to worry about crashing into a neighboring house. It is also very easy to get oriented while you are flying, as the surrounding forest makes a clear line and the runway, the lake and the house are easily spotted. But you’ll have to look out for other planes though, during the day there is almost always one or more aircrafts flying around the runway. The runway is perhaps the most striking feature for the RC-enthusiast, 200*16 meters of asphalt surrounded by grassy areas on three sides and, behind a safety net, a pit area with frequency-board, tables for tweaking even the largest of models and access to electricity for charging and power tools. During the year, Domaine du Planet also hosts special events, meetings and competitions. To name a couple of current ones; the international model circusand week-end warbird pyrotechnics show. If you were to crash your model, there is a workshop with plenty of table area and tools where you can to try and repair it. If something like a servo or a prop were to break there is an RC-shop inside of the workshop! This RC-shop has quite a good range of items, even new models and transmitters as well as servos, propellers and such. For the smaller models, there isn’t as much choice though. 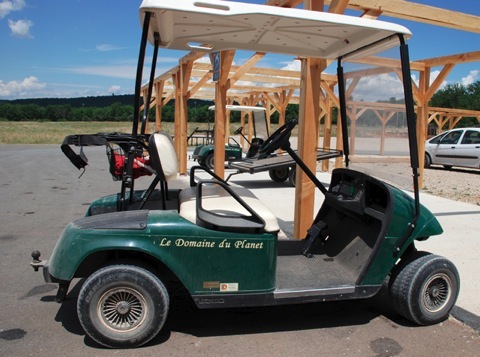 If you have a large model or don’t like to walk around, Domaine du Planet have special golf carts, that can be equipped with trailers, for rent. To sum things up I must say that Domaine du Planet really is a paradise for model flyers. 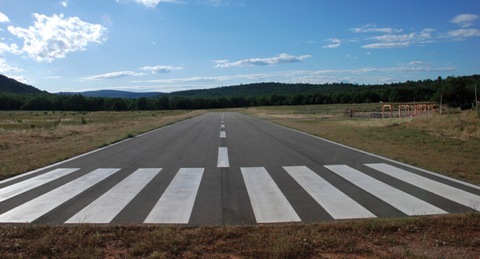 It has a perfect airfield for any type of aircraft with a 200*16 meter asphalt runway only 100 meters from where you sleep. After a long day of flying you can jump in to the pool and then hang out at the bar with people that share the same interest as you and perhaps have a game of billiard. Whenever you crash you have a space to fix it. If you want to improve you flying-skills you can attend a course or have a private trainer. The food is excellent, the rooms are top notch and the staff is great. Before I went to Domaine du Planet, I thought it would be awesome. After my stay I must say that it was even better than I had expected. I highly recommend a stay, you will not regret it!